Die Mercurii, 20° Junii 1832. Gravesend Pier, Paper respecting Erection of, delivered, & referred to Com ee on the Bill. Giles v. Grover & Pollard, Judges to attend. Baillie v. Grant, Judges to attend. Mellish v. Richardson, Judges to attend. London & Birmingham Railway Bill. Inverness Court House, &c. Bill. Exeter & Crediton Railway Bill. Reform (England) Bill, Petition from Barnstaple & Pilton to conjoin Pilton with Barnstaple in the Right of voting. Messages to H.C. with the 2 preceding Bills. Ladbroke's Estate Bill Specially reported. Criminal Laws, Petition from Alton for Revision of. Anatomy Bill, Petition of A. Sleight respecting. Mrs. Moffat's Divorce Bill, Witnesses to attend. It is Ordered, That the further Hearing of the said Cause be put off 'till To-morrow. The House being informed, "That Mr. Tyrrell, from the City of London, attended;"
Copy of the Resolution of the Committee of Thames Navigation in relation to the Erection of a Pier at Gravesend." 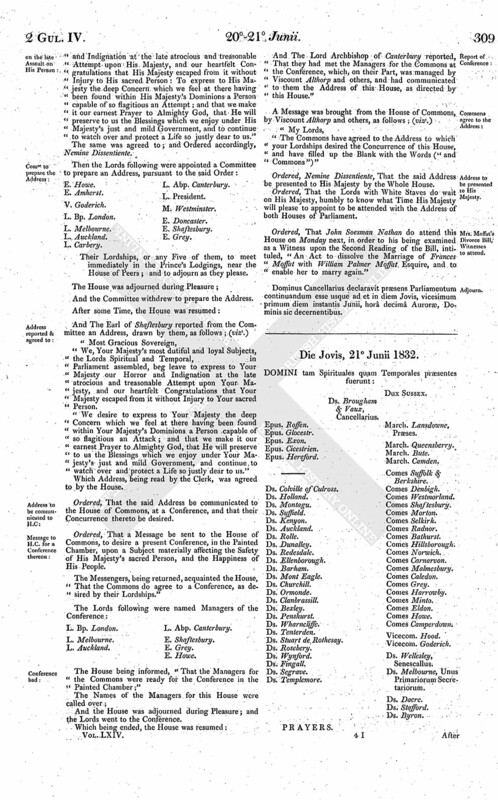 Ordered, That the said Paper be referred to the Committee to whom the Bill, intituled, "An Act for amending an Act passed in the Ninth Year of the Reign of His late Majesty King George the Fourth, intituled, "An Act for rebuilding, or for improving, regulating and maintaining the Town Quay of Gravesend, in the County of Kent, and the Landing Place belonging thereto;" and for building a Pier or Jetty adjoining thereto; and for other Purposes connected therewith," stands committed. Ordered, That the Cause wherein William Spells Gardiner is Appellant, and Stephen Simmons is Respondent, be heard by Counsel at the Bar To-morrow. Mr. Serjeant Taddy stated, "That there was a Witness who had been served with the Order of the House, but who had gone to Bristol notwithstanding; that he trusted it was owing to some Mistake on the Part of that Individual, and that, under the Circumstances, their Lordships would permit him to be called on another Day." Ordered, That the further Consideration and Second Reading of the said Bill be put off to Monday next; and that the Lords be summoned. Ordered, That the Cause wherein Daniel Giles Esquire is Plaintiff, and Harry Grover and James Pollard are Defendants, be taken into further Consideration on Monday next; and that the Judges do then attend further to deliver their Opinions upon the Questions of Law propounded to them on the 4th of July 1831. Ordered, That the Cause wherein Alexander Baillie is Appellant, and Miss Margaret Grant is Respondent, be taken into further Consideration on Monday next; and that the Judges do then attend to deliver their Opinions upon the Question of Law propounded to them on the 14th of May last. Ordered, That the Errors assigned upon the Writ of Error wherein William Mellish is Plaintiff, and George Richardson is Defendant, be argued by Counsel at the Bar on Monday next; and that the Judges do then attend. With a Bill, intituled, "An Act to transfer the Management of certain Annuities on Lives from the Receipt of His Majesty's Exchequer to the Management of the Commissioners for the Reduction of the National Debt; and to amend an Act for enabling the said Commissioners to grant Life Annuities and Annuities for Terms of Years;" to which they desire the Concurrence of this House. With a Bill, intituled, "An Act for the more effectual Prevention of Trespasses upon Property by Persons in Pursuit of Game in that Part of Great Britain called Scotland;" to which they desire the Concurrence of this House. With a Bill, intituled, "An Act for making a Railway from London to Birmingham;" to which they desire the Concurrence of this House. With a Bill, intituled, "An Act for erecting and maintaining a new Court House and Public Offices for the County of Inverness;" to which they desire the Concurrence of this House. To return the Bill, intituled, "An Act for making and maintaining a Railway from the Basin of the Exeter Canal in the Parish of Saint Thomas the Apostle, in the County of Devon, to the Four Mills in the Parish of Crediton, in the said County;" and to acquaint this House, That they have agreed to their Lordships Amendments made thereto. 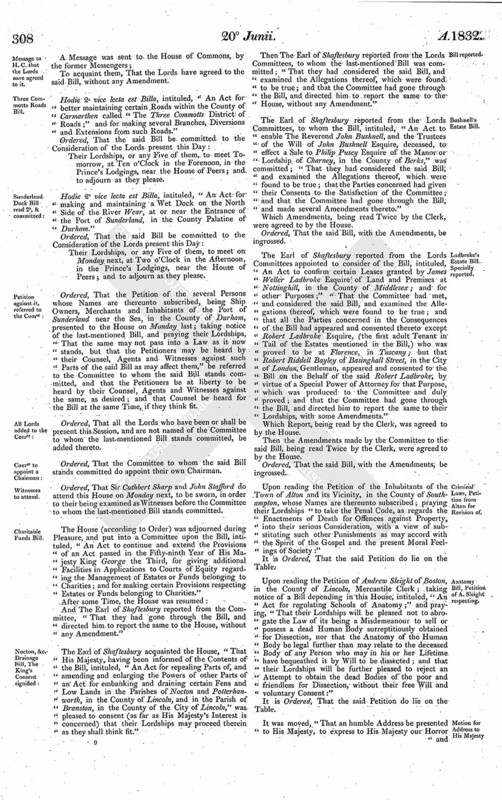 Upon reading the Petition of the Inhabitants of the Towns of Barnstaple and Pilton, whose Names are thereunto subscribed; taking notice of a Bill lately depending in this House, intituled, "An Act to amend the Representation of the People in England and Wales;" and praying their Lordships "to confer on the Householders of Pilton the Right of voting for a Representative in the Commons House of Parliament conjointly with Barnstaple:"
Ordered, That the said Bill be read a Second Time on Monday next; and that the Lords be summoned. Hodie 3a vice lecta est Billa, intituled, "An Act to render more effectual an Act passed in the Fifty-ninth Year of His late Majesty King George the Third, intituled, "An Act to amend and render more effectual an Act passed in the last Session of Parliament, for building and promoting the building of additional Churches in populous Parishes." Hodie 3a vice lecta est Billa, intituled, "An Act for shortening the Time required in Claims of Modus decimandi, or Exemption from or Discharge of Tithes." Hodie 3a vice lecta est Billa, intituled, "An Act to apply the Sum of Four Millions out of the Consolidated Fund to the Service of the Year One thousand eight hundred and thirty-two." Hodie 2a vice lecta est Billa, intituled, "An Act for better maintaining certain Roads within the County of Carmarthen called "The Three Commotts District of Roads;" and for making several Branches, Diversions and Extensions from such Roads." Hodie 2a vice lecta est Billa, intituled, "An Act for making and maintaining a Wet Dock on the North Side of the River Wear, at or near the Entrance of the Port of Sunderland, in the County Palatine of Durham." Their Lordships, or any Five of them, to meet on Monday next, at Two o'Clock in the Afternoon, in the Prince's Lodgings, near the House of Peers; and to adjourn as they please. 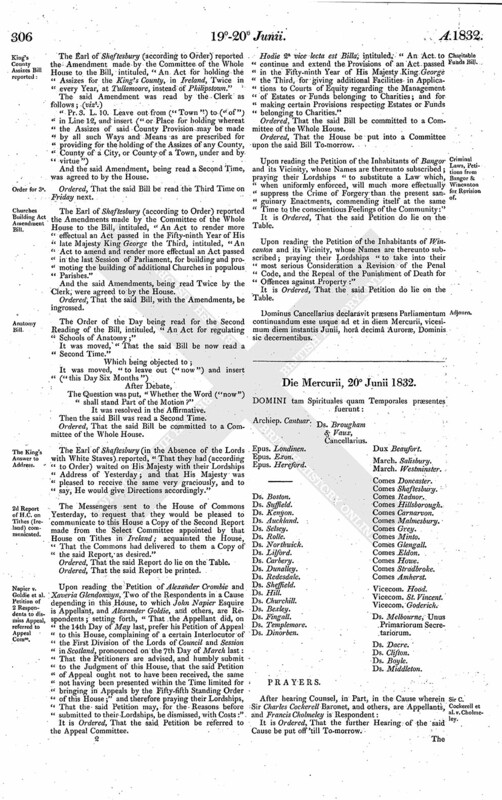 Ordered, That the Petition of the several Persons whose Names are thereunto subscribed, being Ship Owners, Merchants and Inhabitants of the Port of Sunderland near the Sea, in the County of Durham, presented to the House on Monday last; taking notice of the last-mentioned Bill, and praying their Lordships, "That the same may not pass into a Law as it now stands, but that the Petitioners may be heard by their Counsel, Agents and Witnesses against such Parts of the said Bill as may affect them," be referred to the Committee to whom the said Bill stands committed, and that the Petitioners be at liberty to be heard by their Counsel, Agents and Witnesses against the same, as desired; and that Counsel be heard for the Bill at the same Time, if they think fit. Ordered, That Sir Cuthbert Sharp and John Stafford do attend this House on Monday next, to be sworn, in order to their being examined as Witnesses before the Committee to whom the last-mentioned Bill stands committed. 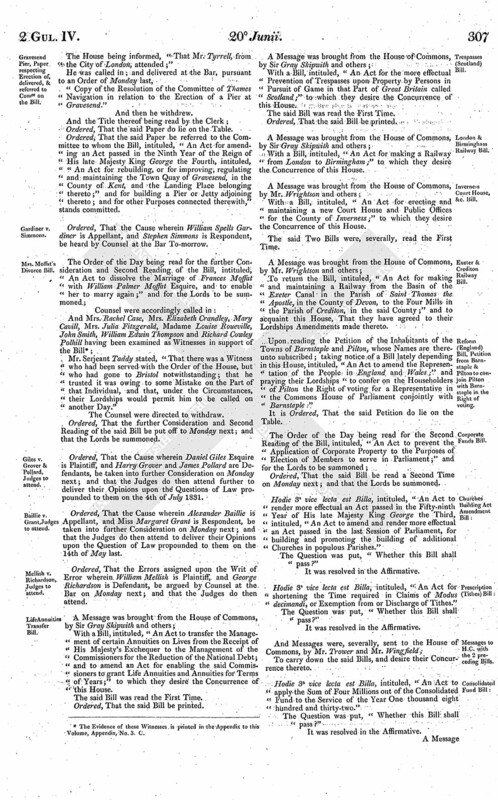 The House (according to Order) was adjourned during Pleasure, and put into a Committee upon the Bill, intituled, "An Act to continue and extend the Provisions of an Act passed in the Fifty-ninth Year of His Majesty King George the Third, for giving additional Facilities in Applications to Courts of Equity regarding the Management of Estates or Funds belonging to Charities; and for making certain Provisions respecting Estates or Funds belonging to Charities." The Earl of Shaftesbury acquainted the House, "That His Majesty, having been informed of the Contents of the Bill, intituled, "An Act for repealing Parts of, and amending and enlarging the Powers of other Parts of an Act for embanking and draining certain Fens and Low Lands in the Parishes of Nocton and Potterhanworth, in the County of Lincoln, and in the Parish of Branston, in the County of the City of Lincoln," was pleased to consent (as far as His Majesty's Interest is concerned) that their Lordships may proceed therein as they shall think fit." Then The Earl of Shaftesbury reported from the Lords Committees, to whom the last-mentioned Bill was committed; "That they had considered the said Bill, and examined the Allegations thereof, which were found to be true; and that the Committee had gone through the Bill, and directed him to report the same to the House, without any Amendment." The Earl of Shaftesbury reported from the Lords Committees, to whom the Bill, intituled, "An Act to enable The Reverend John Bushnell, and the Trustees of the Will of John Bushnell Esquire, deceased, to effect a Sale to Philip Pusey Esquire of the Manor or Lordship of Charney, in the County of Berks," was committed; "That they had considered the said Bill, and examined the Allegations thereof, which were found to be true; that the Parties concerned had given their Consents to the Satisfaction of the Committee; and that the Committee had gone through the Bill, and made several Amendments thereto." The Earl of Shaftesbury reported from the Lords Committees appointed to consider of the Bill, intituled, An Act to confirm certain Leases granted by James Weller Ladbroke Esquire of Land and Premises at Nottinghill, in the County of Middlesex; and for other Purposes;" "That the Committee had met, and considered the said Bill, and examined the Allegations thereof, which were found to be true; and that all the Parties concerned in the Consequences of the Bill had appeared and consented thereto except Robert Ladbroke Esquire, (the first adult Tenant in Tail of the Estates mentioned in the Bill,) who was proved to be at Florence, in Tuscany; but that Robert Riddell Bayley of Basinghall Street, in the City of London, Gentleman, appeared and consented to the Bill on the Behalf of the said Robert Ladbroke, by virtue of a Special Power of Attorney for that Purpose, which was produced to the Committee and duly proved; and that the Committee had gone through the Bill, and directed him to report the same to their Lordships, with some Amendments." Then the Amendments made by the Committee to the said Bill, being read Twice by the Clerk, were agreed to by the House. Upon reading the Petition of the Inhabitants of the Town of Alton and its Vicinity, in the County of Southampton, whose Names are thereunto subscribed; praying their Lordships "to take the Penal Code, as regards the Enactments of Death for Offences against Property, into their serious Consideration, with a view of substituting such other Punishments as may accord with the Spirit of the Gospel and the present Moral Feelings of Society:"
Upon reading the Petition of Andrew Sleight of Boston, in the County of Lincoln, Mercantile Clerk; taking notice of a Bill depending in this House, intituled, "An Act for regulating Schools of Anatomy;" and praying, "That their Lordships will be pleased not to abrogate the Law of its being a Misdemeanour to sell or possess a dead Human Body surreptitiously obtained for Dissection, nor that the Anatomy of the Human Body be legal further than may relate to the deceased Body of any Person who may in his or her Lifetime have bequeathed it by Will to be dissected; and that their Lordships will be further pleased to reject an Attempt to obtain the dead Bodies of the poor and friendless for Dissection, without their free Will and voluntary Consent:"
It was moved, "That an humble Address be presented to His Majesty, to express to His Majesty our Horror and Indignation at the late atrocious and treasonable Attempt upon His Majesty, and our heartfelt Congratulations that His Majesty escaped from it without Injury to His sacred Person: To express to His Majesty the deep Concern which we feel at there having been found within His Majesty's Dominions a Person capable of so flagitious an Attempt; and that we make it our earnest Prayer to Almighty God, that He will preserve to us the Blessings which we enjoy under His Majesty's just and mild Government, and to continue to watch over and protect a Life so justly dear to us." The same was agreed to; and Ordered accordingly, Nemine Dissentiente. L. Carbery. L. Abp. Canterbury. Their Lordships, or any Five of them, to meet immediately in the Prince's Lodgings, near the House of Peers; and to adjourn as they please. And the Committee withdrew to prepare the Address. "We, Your Majesty's most dutiful and loyal Subjects, the Lords Spiritual and Temporal, in Parliament assembled, beg leave to express to Your Majesty our Horror and Indignation at the late atrocious and treasonable Attempt upon Your Majesty, and our heartfelt Congratulations that Your Majesty escaped from it without Injury to Your sacred Person. "We desire to express to Your Majesty the deep Concern which we feel at there having been found within Your Majesty's Dominions a Person capable of so flagitious an Attack; and that we make it our earnest Prayer to Almighty God, that He will preserve to us the Blessings which we enjoy under Your Majesty's just and mild Government, and continue to watch over and protect a Life so justly dear to us." Ordered, That the said Address be communicated to the House of Commons, at a Conference, and that their Concurrence thereto be desired. Ordered, That a Message be sent to the House of Commons, to desire a present Conference, in the Painted Chamber, upon a Subject materially affecting the Safety of His Majesty's sacred Person, and the Happiness of His People. The Messengers, being returned, acquainted the House, That the Commons do agree to a Conference, as desired by their Lordships." L. Auckland. L. Abp. Canterbury. The House being informed, "That the Managers for the Commons were ready for the Conference in the Painted Chamber;"
And The Lord Archbishop of Canterbury reported, That they had met the Managers for the Commons at the Conference, which, on their Part, was managed by Viscount Althorp and others, and had communicated to them the Address of this House, as directed by this House." "The Commons have agreed to the Address to which your Lordships desired the Concurrence of this House, and have filled up the Blank with the Words ("and Commons")"
Ordered, Nemine Dissentiente, That the said Address be presented to His Majesty by the Whole House. Ordered, That the Lords with White Staves do wait on His Majesty, humbly to know what Time His Majesty will please to appoint to be attended with the Address of both Houses of Parliament. Ordered, That John Soesman Nathan do attend this House on Monday next, in order to his being examined as a Witness upon the Second Reading of the Bill, intituled, "An Act to dissolve the Marriage of Frances Moffat with William Palmer Moffat Esquire, and to enable her to marry again." Dominus Cancellarius declaravit præsens Parliamentum continuandum esse usque ad et in diem Jovis, vicesimum primum diem instantis Junii, horâ decimâ Auroræ, Dominis sic decernentibus. 1. The Evidence of these Witnesses is printed in the Appendix to this Volume, Appendix, No. 3. C.